Cars, sadly, hit all kinds of animals on the road, and usually it doesn’t end very well, though sometimes our furry friends survive. A couple of months ago, for example, a coyote somehow survived the collision. And last week in Virginia, a bobcat also escaped death, while getting a free 50-mile ride in what must have been an extremely uncomfortable position. 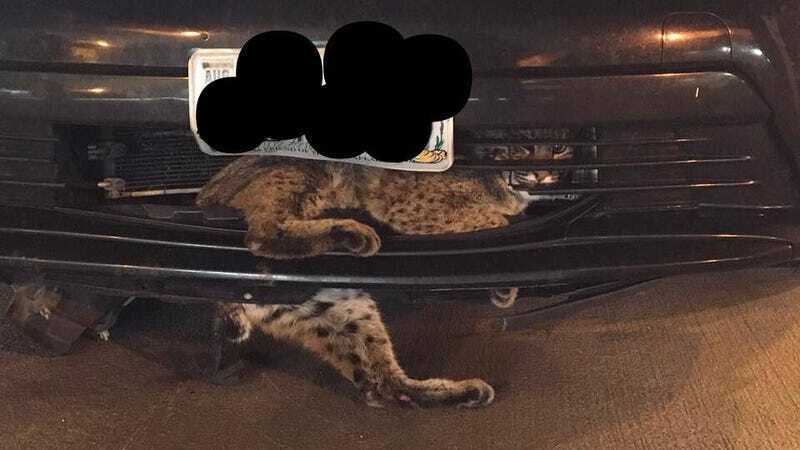 It all happened on Thanksgiving morning, when a woman driving a Toyota Prius struck the bobcat on her way to work, not realizing until she she got to her destination that what she had struck was still attached to the grille. It was also still alive. Experts from Richmond Animal Care and Control swiftly came to the rescue. I, too, would hiss at you if you made me ride 50 miles in the cold stuck on your grille. The extraction, though, proved fairly straightforward. The bobcat has been checked for injuries, but apparently only suffered a minor cut on his back. He is currently being held at a wildlife center in Waynesboro, Virginia, though will eventually be released back into the wild, according to WTRV. The driver’s name was not released. If you think you’ve hit a bobcat on your morning commute, maybe step out and check.